Our Sponsors will be aware from our latest newsletter (March 2019) that, after 29 years, the decision has been taken to close our Branch Sponsorship Scheme. Rest assured that it will make no difference to the support that we give to our sponsored cats, which will remain in our care. For the time being, information about our Sponsored cats remains below. 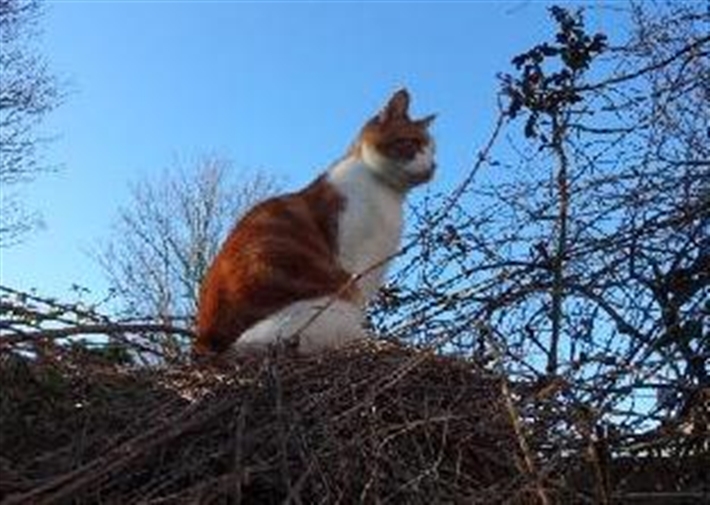 However, if you would like to support our Branch by sponsoring cats, then the charity has a national scheme whereby cat pens (and, of course, their feline occupants) in adoption centres can be sponsored whilst the funds raised will benefit the work done by Lea Valley Branch locally, including the continuing care of our Sponsored cats. Details of this sponsorship scheme can be found by clicking here. Throughout your time as a Sponsor, Cats Protection will keep you posted with regular newsletters and new photos of the cat in your pen and will update you by email with stories, videos and photos on all the sponsorship news. You can even access your sponsor area on the CP website where you can see more information about the cats you're helping, including videos and wonderful photos of your current sponsor cat. As well as the many cats that are available for adoption, we also have some in our care who cannot, for various reasons, be adopted into new homes and must remain in foster care for the rest of their lives. Some are simply too old to adjust to another home; others have health problems. 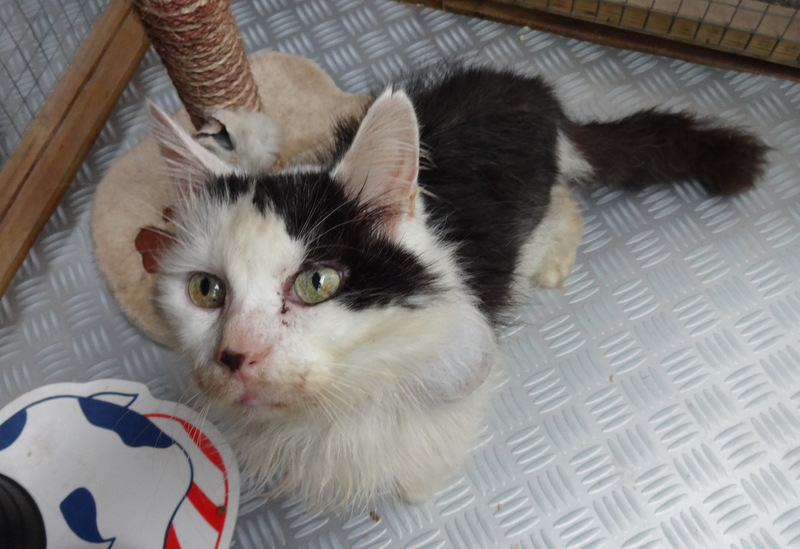 Sadly we also have cruelty cases where the cat is too traumatised and could not cope with a new home. BUT we do need money to keep these cats safe and well in our care. We need to provide for their food and keep; many need regular medication and other veterinary care - and this all costs! To pay for this, we operate the Lea Valley Sponsorship Scheme. 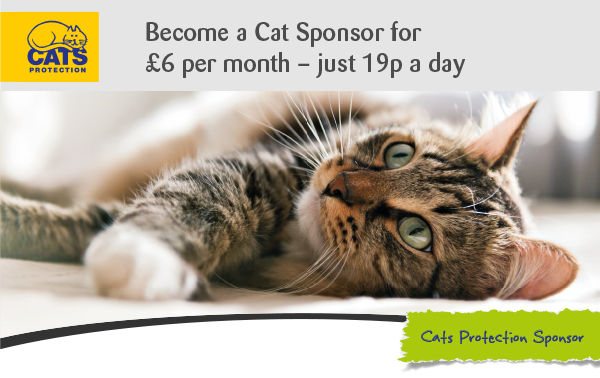 For a minimum of £20 a year you can sponsor a cat of your choice. When you sign up, you receive a certificate and a photo of your chosen cat. You will also receive regular newsletters keeping you up-to-date with their progress. The Sponsorship Scheme makes an excellent present, especially for someone who loves cats but who cannot own one. Here is our current list of cats for sponsorship; if you are interested in sponsoring one (or more!) of them, then please e-mail Stephanie at stephanie.duffy1@btinternet.com and she can send you more information. 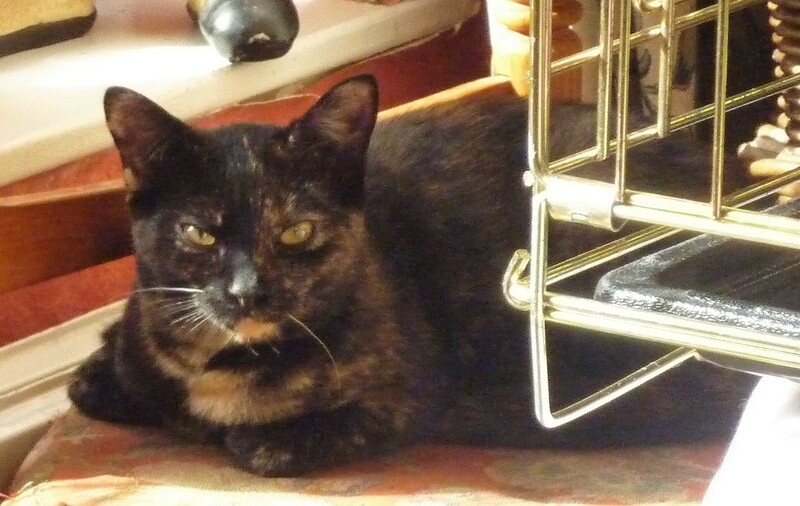 LINDI-LOU was born in June 2011; she is a pretty, dark tortoiseshell with a white bib, who came into Yvonne’s care when, along with her Mum, she was thrown out by their owner following the birth of a baby. 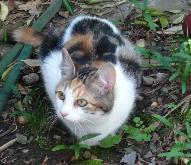 (Unfortunately, Mum had turned feral, so all Yvonne has been able to do is get her neutered. A kind neighbour was willing for her to be returned.) As Lindi-Lou was only 4 months old at the time, Yvonne decided to try and work with her, to give her a good chance in life. She was spayed, microchipped and had vaccinations to give her the best protection at the start of her young life. After two months in a pen, Yvonne managed to get her to a 'semi-feral' state. She will play with her toys and sometimes allows Yvonne to stroke her. She can return to her pen if she likes, or even venture through the cat flap into Yvonne’s house; the choice is hers to make. TABITHA is an 11 year-old, tabby/white female who came into our care when her ow ner died. 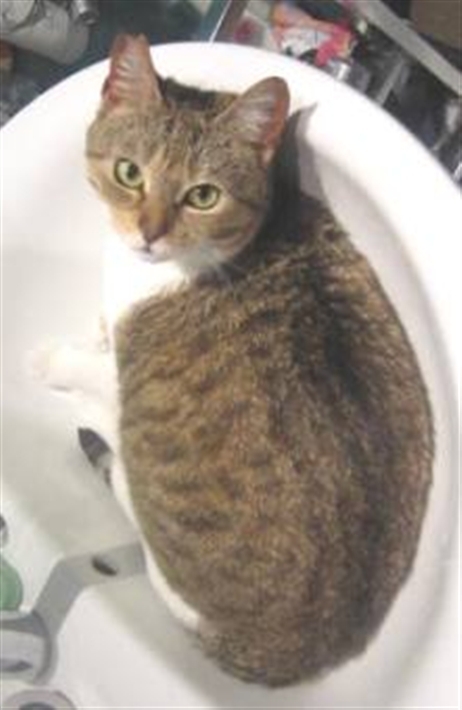 Tabitha was found to have a heart murmur, which was definitely more pronounced each time she was under stress, namely, at the vets. Unfortunately she had a broken tooth that was causing her considerable pain and it had to be removed. Thankfully, she came through the ordeal and was none-the-worse for wear. 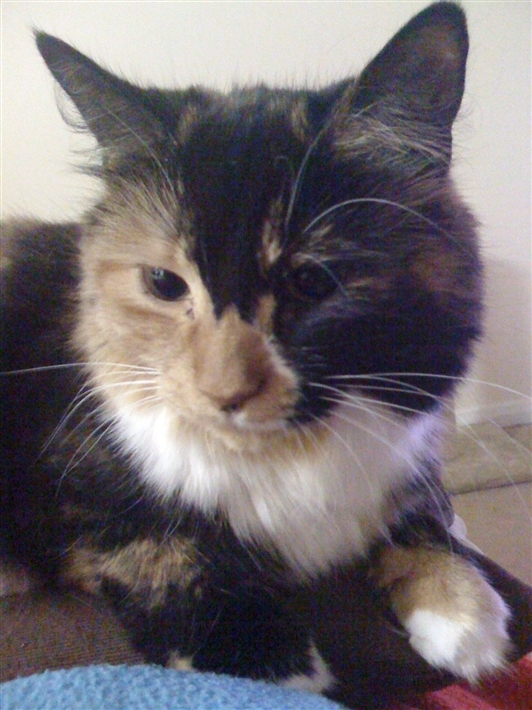 WINNIE is a 10 year-old, long-haired, tortoiseshell girl. She came into our care after her owner could no longer look after her. Winnie became unwell and would not eat for several weeks and, at the Royal Veterinary College Hospital, she was diagnosed with having Key-Gaskell Syndrome. This leaves the pupils of her eyes permanently dilated, which causes her discomfort in bright daylight; however she appears well otherwise. She now lives in an indoor home which minimises her exposure to the light and, although she is well now, we will continue to meet the cost of any treatment she may need in the future. HUSKY, a female tabby, is a rather unpredictable cat, one moment being very sweet and enjoying a fuss and the next deciding to hiss and spit. She was bought as a small kitten from a pet shop and may have originally been abandoned by her mother. Husky was loved but she was alone much of the day whilst her owners were at work, so interacting time with humans was reduced. She started to hide a lot and, with the arrival of children, the relationship became more difficult. When Husky was four years old, the family made contact with CP and she was brought into care. Husky proved difficult to home but is now settling with her foster family who are working hard to gradually win her around. Pat and Tony are prepared to spend time stroking and talking to her gently, trying to moderate her difficult behaviour. She has been nicknamed Hidey Cat by Pat and Tony as she still spends time hiding and they just have to wait for her to reappear! BRUCE came into Lea Valley’s care with his mum and siblings at about 12 weeks old after Kay discovered them living in bushes in Edmonton. Although Bruc e’s mother was domesticated, her young litter had had no contact with humans. Although the family were progressing well with their fosterers, Bruce was moved to fosterer Kay as he wasn’t as advanced as his siblings. He started to come out of his shell, but then unfortunately caught ringworm which meant 3-4 months of treatment in isolation because of the contagious nature of the condition. Consequently, he built a strong bond with Kay. When Bruce was cleared of ringworm he was adopted into a lovely new home. Unfortunately, he became very distressed and, after three days, he came back to Kay. He is a very loving cat with a placid nature, happy and settled with Kay and her family and enjoying the company of other cats. BORIS & DARCY and their two sisters were brought in from a back garden in Edmonton where a kind, elderly man was feeding them and their mum and dad. The parents were trapped, neutered and returned as they were semi-feral. We took a chance taking the kittens as they were about 12 weeks old but, because their long-term care was unsure, we felt they needed a chance. 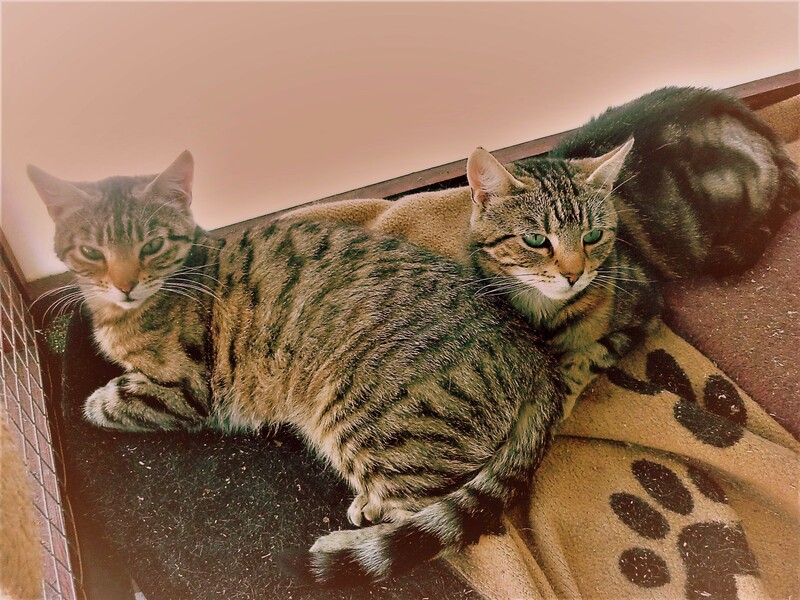 Kay took Boris (tabby male) from his original fosterer to speed-up his improvement; after making good progress, he was moved to an indoor fosterer to get him used to the ‘inside’. 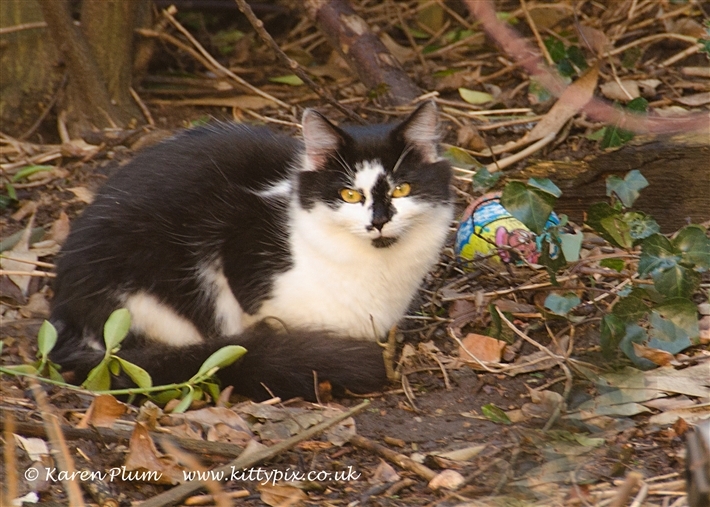 Darcy (black and white female) was then moved to Kay for some intense interaction and was slowly showing progress. However, Boris was not doing so well and refused to budge from under the new fosterer’s sofa. After three weeks he came back to Kay and was reunited with Darcy. Both cats were very pleased to see each other and became inseparable. Kay let them both out of their pen into the garden and they loved it. They get on well with the resident cats, in particular Bruce. They both have a good quality of life with shelter, food and care and it would be unfair to relocate them to another home. RAINBOW In February 2015, Kay was called to a school in Ponders End where a mum, dad and two 3 month-old kittens had set up their home. The kittens were semi-feral, having not been handled. Kay initially intended to return a month later so that the kittens would be a bit bigger and ready for neutering. However, she noticed that the tortoiseshell and white kitten had a bad eye and so trapped both her and her sister straight away. The sister, who was particularly wild, was neutered and returned along with the father cat. The school wanted them back and had committed to feeding them and building them a kennel. The mother was taken into our care as she was domestic and heavily pregnant. Rainbow had cat flu and stayed in Kay’s pen for quite a while to recover. Kay had the very difficult job of administering eye drops twice a day for a week! After she had recovered, Kay decided to try and tame her, but after a couple of months, she showed no sign of wanting this. She was brought into the house for socialisation, but this was not successful either. In this time, she had become very friendly with Kay’s other cats, and the decision was taken to let her have the run of the garden with shelter. Rainbow loves this way of living and enjoys the company of the other cats immensely. She is now a very healthy and beautiful young lady who has joined the sponsorship scheme. BASIL had been seen visiting a garden for some time but, as time went by, his condition deteriorated to the extent that he was in need of care and attention. When he was taken into care, he had an enormous growth on his neck. Having been seen by the vet, who thought Basil to be aged from 8-10 years, the large growth was found to be a cyst and he was also diagnosed with hyperthyroidism (an over-active thyroid) which, amongst other things, meant that his heart was be ating far too fast for the vet to operate safely to treat the thyroid and remove the cyst. So he was placed in Kay’s pen and, for the next six weeks, had tablets to correct the thyroid condition. When the blood levels and heart rate had returned to a normal level, the decision was taken to operate on his thyroid and to cut out the unsightly cyst. Basil came through the operations well. However, unfortunately the operation had caused hypothyroidism (an under-active thyroid), so he was now putting on too much weight. Basil now takes a tablet daily which has corrected the hypothyroidism, but he will have to keep taking the tablets all his life. He has been lucky enough to have been given a home with Eileen, the lady who originally found him, and her two cats. Basil is now looking so much better and his quality of life is wonderful, enjoying his new home and lovely garden. Because of his ongoing condition, Basil has joined our sponsorship scheme. 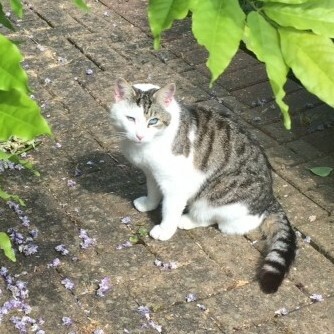 RILEY is a white and tabby cat that came from a smallholding in Botany Bay, Enfield when it was sold. He lives outside and has freedom in which to roam in the fields, but tends to stay quite near the bungalow, appearing at mealtimes. He seems to like people and the occasional stroke. If the back door is open he may venture in for a short while. He has a kennel to use at night but rarely sleeps there, just coming to get his food from it. Riley was unhappy being confined to a pen when he first arrived with his fosterer but is now happy to wander. He and Valerie’s cat are still getting used to one another and have had the occasional wrestling match in the garden! Emerald, so called because of her emerald green eyes, came to Cats Protection with her four kittens in 2016. Three have been rehomed but Emerald and her daughter, Amber, remained skittish and did not like to be touched; getting them to the vet for neutering was extremely difficult. Their fosterer worried about letting them out of their pen, convinced that they would run off into the surrounding fields and forest. However, after an initial exploration, they returned to their pen to sleep and eat. Emerald and Amber then had their freedom with lots of outbuildings and countryside to explore. They were very happy with their lives but remained far too timid to home. Sadly, Amber died recently but Emerald remains content with her life of freedom. CLEO, a tortoiseshell, was one of three semi-feral kittens to come into care in 2015. Her brother and sister responded well to humans and were rehomed quickly, but Cleo has remained fairly wild. Every now and then she will approach her fosterer for a stroke, but she will never be tame enough to rehome. Cleo is happy in the security of her fosterer’s home, but panics if she finds herself left outside. Notes on our sponsored cats are correct as at March 2019.